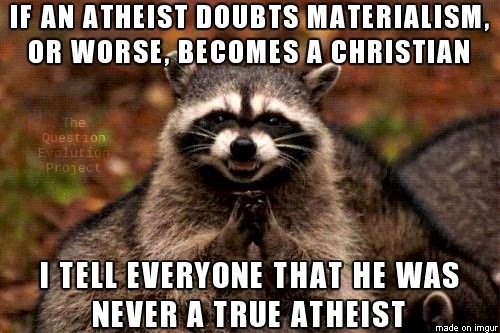 No True Atheist Doubts Atheism! Atheism is in trouble. It is on the decline globally 1, 2, they are the least-liked, least trusted group 3 (but their status may have improved slightly since the surveys were taken), and they humiliate themselves and even other atheists with their antics 4. Some will whine, "We're persecuted!" Seldom true. "You hate me because I'm an atheist!" Also seldom true, but you identify with anti-Christian bigots 5, and that doesn't help you. In addition, the idea of a universe that caused itself is philosophically and scientifically untenable 6, and they hate that fact. One thing that militant atheopaths cannot tolerate is a defector, whether it is someone who leaves their religion 7, or dares to question materialism since most rely on that. Materialistic evolution is also a tenet of fundamentalist atheism 8. I've noticed that they seem to attack former atheists with amazing vitriol, almost as much as they give to biblical creationists — and there are creationists who were atheists at one time 9. Militant atheopaths seem to get along with theistic evolutionists, and I think that is because TEs are closer to atheism than others who call themselves Christian (and I agree with some others who suspect that many TEs are actually just Deists). Next, they tolerate old-earth creationists (OECs) to some extent. But they detest young-earth creationists (YECs, also called biblical creationists), probably because we stand on the authority of the Bible and are not swayed by the ever-changing speculations of science philosophies. Thomas Nagel dared to think beyond atheist orthodoxy and said that they had some wrong views about materialism. Instead of acting like the brilliant intellectuals that they pretend to be, they went into ridicule mode against one of their own. Philosopher Thomas Nagel, who made a serious challenge to materialism in his book Mind and Cosmos, is still the focus of heated debate. At a gathering of philosophers and scientists that included Daniel Dennett and Richard Dawkins, a workshop on naturalism turned into an all-out attack on Nagel, a Professor of Law and Philosophy at New York University. Nagel’s claim that materialists’ conception of nature is wrong was too much for the workshop participants, according to Andrew Ferguson, a senior editor at The Weekly Standard. In an article titled ‘The Heretic’, Ferguson discussed what happened in the workshop and also considered why Nagel’s book so angered his critics. Follow the link to finish reading "Thomas Nagel—The atheist who dared to question materialism". There is a music "video" below for Christians. We have defected from Satan's stronghold. He and his minions are very angry indeed. The lyrics are here.